My sister constantly tells me that I’m not a hipster, and can’t even begin to understand “her” type. But with my Facebook feed and online news feed blowing up with people analyzing what the Pope said while visiting the United States, even she will have to admit I’m “hipster” in at least one way. I saw Pope Francis before it was cool! I didn’t necessarily start the trend. On the contrary, I was just one of tens of thousands. I didn’t even realize that the Pope was coming to America until just a few days before he left for Cuba. But I saw him a week before anyone in the USA did. All I had to do was go to The Vatican. I first learned about Vatican City when I was in sixth grade. The religious connotations didn’t matter much to me at the time, but I made it my goal to someday go to the world’s smallest nation. When I got to Rome three weeks ago, the person checking me in asked, “do you want to see the Pope?” Um, sure! I hadn’t really thought of that as feasible, but she told me that all I had to do was show up at the Vatican on Wednesday morning. So when Wednesday morning came, I excitedly walked all the way across the city and entered the fifth country of my Mediterranean Trek. When I got there, the event was already in progress. I’m not sure it it’s officially considered a mass, but there was singing, Bible reading, and a couple people spoke, one of whom was Pope Francis himself. I got my bag searched at the country’s entrance (which I learned when I returned another day is not an everyday thing, it’s just for the Pope’s safety when he’s so close to so many people), and I found a good place to stand. If you make a reservation ahead of time, you can get a seat that’s a little bit closer. But the standing room was nice and open, and there were jumbotrons so that you could see everything that was happening onstage. After the service, most people left, but none of the Vatican’s attractions, such as St. Peter’s Basilica or the temporary exhibit, opened up, and security was still tight. I decided to stick around to see if something else would happen. Over an hour later, one of the seating sections was emptied out and some of the rowdy, Argentina-national-anthem-chanting crowd had moved there, so I got up closer to the basilica, too. Finally, Papa Francesco appeared again and waved at us all as he rode away. Soon after, the Basilica entrance opened up, and I was able to walked by the stage and see the chair where Pope Francis had sat that morning. This is a weekly occurrence every Wednesday morning. Just a day or so later, I switched to another Rome hostel. Someone there told me that the Pope also gives a message every Sunday that he’s in town. It wasn’t as formal as Wednesday, but rather just a 15-minute speech given from his window. That sounded interesting! 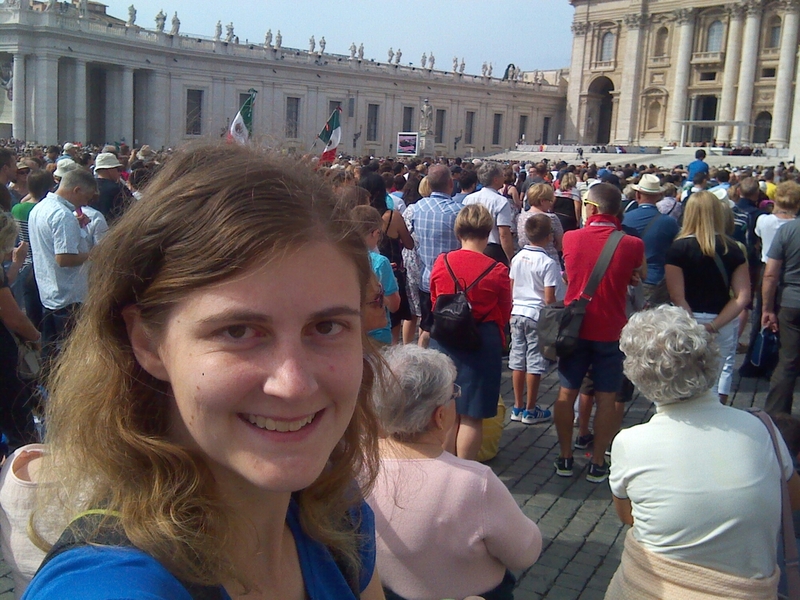 So on Sunday, I walked back to the Vatican. Since I guess his window is far enough to make it difficult for assassins, there was no bag check at the border this time. It was also less crowded, and the seated section was closed off since you couldn’t really see the window anywhere but from the standing area. I wasn’t really sure which window he would appear at, but a few minutes before the scheduled time, someone opened a window and hung a banner out of it. 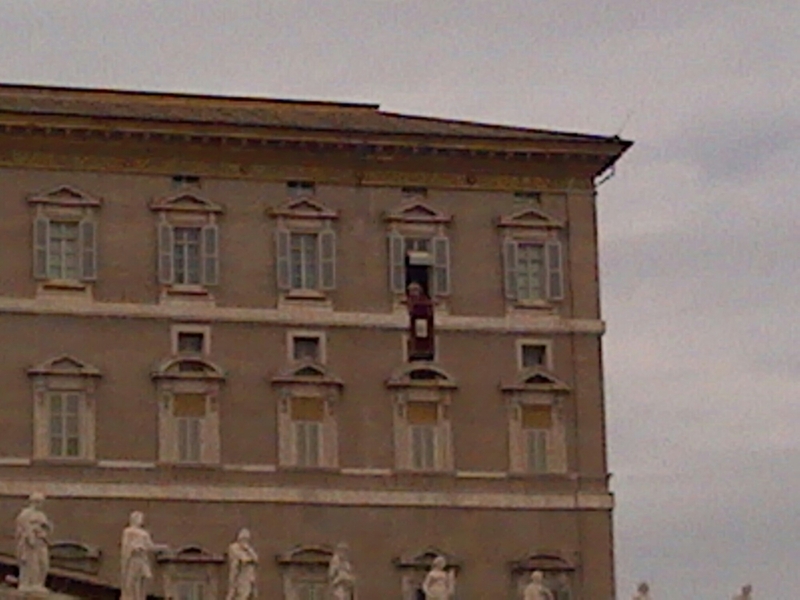 Right on time, Papa Francesco appeared, waving back to the thousands of people below! As he spoke, I took pictures of him in his window and got a better look from the jumbotrons (to make sure it really was him), but didn’t really listen to the message. One benefit that the Americans had over me is that they could hear him speak in English, which doesn’t happen in the Vatican! I am very limited when it comes to Italian, mostly just knowing food words, but all I really know is that Pope Francis was not telling us what he was going to eat for lunch! He spoke very eloquently and didn’t really use any simple words that I could make out. Sometimes people would cheer about what he was saying. I wasn’t sure what to do. Had he said something that I would also cheer for, or did he say something that was completely against my personal beliefs? I don’t really know for sure, but just having the rare opportunity to see the world’s most famous living religious leader was amazing! I went to Vatican City two other times. 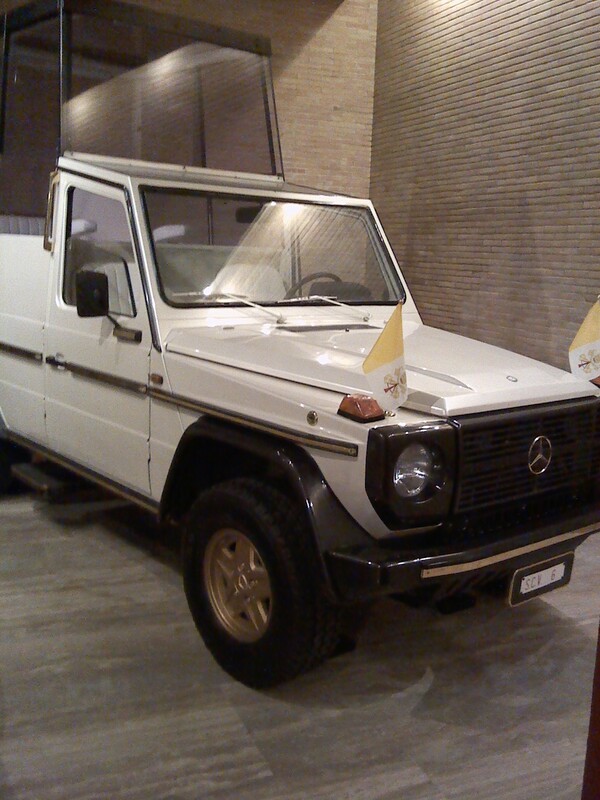 While there, I enjoying the country’s other offerings, like climbing to the top of the cupola, straining my neck to admire the Sistine Chapel, and seeing a museum featuring many past Popemobiles. These were all great experiences, but there was something extra special about being there with the Pope! My last full day in Rome was a Sunday, but sadly, Papa Francesco had already made his way to Cuba. I attended an international English-speaking Baptist church that morning instead, and after the service when I headed over to the Vatican for one last goodbye, the nation was eerily empty. I’m not Catholic so I obviously don’t support everything that the Pope says or does. But I am a Christian and I think that he and I have a few of the most important beliefs in common. But I didn’t write this post to make any political statement. Besides, like I said, I really don’t know what he was talking about in the two occasions I visited him. All I know is that I got to see Pope Francis before most other Americans, and that makes me pretty hipster! Have you ever seen the Pope, whether it was recently in America, previously in Italy, or even just on TV? What European celebrity would you like to meet?